Pid is a game that will reward those willing to commit to beating it with some clever mechanics and charming presentation. The 2D platformer has made a major comeback in recent years, thanks to the boom of the indie gaming scene. Games such as Braid, Limbo, and Dust: An Elysian Tail have brought the classic genre back into the high-def limelight with style. The latest game in this mold is now here in the form of Pid, and though it brings with it a heavy element of frustration in the form of some major trial-and-error based challenge, it also brings some novel gameplay elements into the fold. The narrative is slight, but does exist. A boy named Kurt is taking a space bus back to his home planet, but falls asleep during the journey and is teleported to a mysterious world. Kurt soon finds out about a threat facing this world that must be confronted if he ever wishes to find his way home. This plot is delivered through both a storyboard-like illustrated intro and text boxes complemented by gibberish-like voice acting. The game doesn’t place a heavy emphasis on it as a whole when compared to the gameplay itself, but it’s nice to have it there. 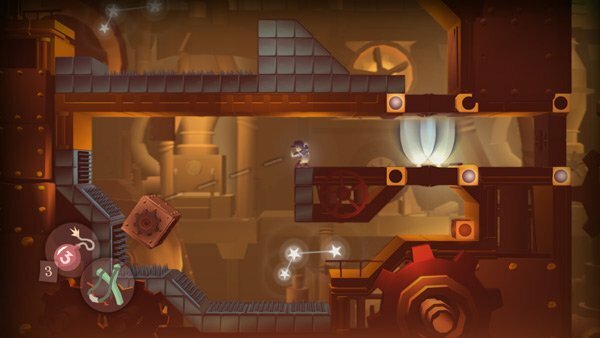 What Pid is really about is the core elements of platforming – namely running, jumping, and traversing landscapes. 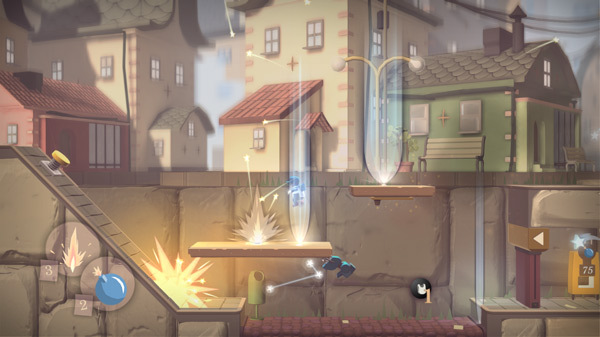 Kurt must traverse through various environments such as a kitchen, opera house, and city to find his way home, while avoiding various enemies along the way. The big twist on the gameplay comes in the form of the Beam, a strange device Kurt discovers in the first few minutes of gameplay. This enables him to throw projectiles of light (up to two at a time) on the walls, ceilings, and floors. A beam of light will shoot from wherever the projectile lands, and will enable Kurt to float in a specific direction if he enters it. Floor beams will move him up, ceiling beams will move him down, and wall beams will move him left or right. As Kurt is generally not able to attack enemies head-on with a simple punch or bop on the head like many other platformers, using the Beam efficiently is the key to surviving the journey. Enemies can be affected by the lights as well, allowing you to carry them into some of the spiked areas sprinkled throughout each level or float them out of your way. This creative mechanics is what makes Pid stand out from other games, and it generally works pretty well. There is definitely a learning curve in learning to manuever between lights, but it’s satisfying when you start to get the hang of it. This is all brought to life through a simple but appealing art style. The supporting characters resemble blocky robots of sorts, while the environments strike a great balance between having too little detail or too much. The overall art direction of Pid is one of its standout features for sure, and players will find all sorts of eye candy to get immersed into. A simple soundtrack, primarily drum and bass-driven, also adds to the atmosphere. Where Pid stumbles a bit, at least in terms of general accessibility, is its level of challenge. This is a game that gets difficult early on and doesn’t change that. Many rooms have multiple projectile-firing enemies patrolling them. along with spikes and other obstacles, and for many of them, it’s doubtful players will get all the way through on their first try. There’s a lot of trial and error involved, and while it rarely leaves you feeling like your death wasn’t your fault, it would have been nice if the game eased players into its difficulty. This is partially remedied by the game’s currency and item systems. Scattered throughout the levels are small constellations of stars that can be collected much like Mario’s coins or Sonic’s rings. Unlike those, these don’t contribute to your character’s health or lives. In fact, lives here are unlimited, and checkpoints are thankfully frequent. What stars are used for is to buy items at various dispensers scattered throughout levels, such as body armor that allows you to take an extra hit or bombs that can take out or damage most enemies. While you can’t choose which items each vendor offers, it’s a nice system to offer that gives players more of a fighting chance. Pid is a game that will reward those willing to commit to beating it with some clever mechanics and charming presentation. It just may not be for absolutely every platforming lover out there, especially those looking for more of a fun romp than an outright challenge. Going further, the title features an unlockable Hard mode for those who want an excuse to play through the whole thing again. Pid is not a classic, but there’s enough here for it to get a recommendation.